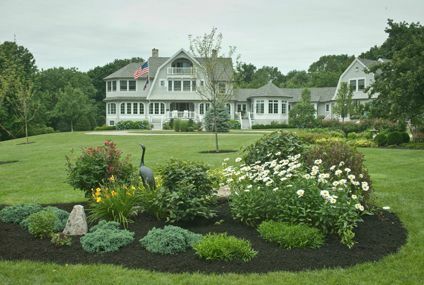 With 35 years of industry experience, Salmon Falls Nursery & Landscaping has an impressive portfolio of residential and commercial projects. We invite you to take a look at a few of our favorite projects. We hope these images spark some ideas for you, and provide inspiration for your own landscapes. We have spent the last three years developing this landscape by adding to existing beds and creating new ones. We designed three large gardens in the expansive front yard adding interest, shape, and dimension. Native Red Maple trees have been added to the lawn area to create some shade and help prevent the lawn from burning out in the hot summer. This new-construction home on Great East Lake features terraced walls that are both attractive and functional. 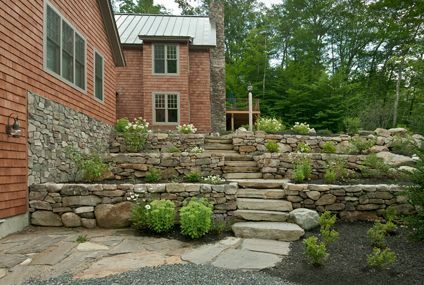 The terraced garden works to slow runoff eliminating washout by the house and driveway. 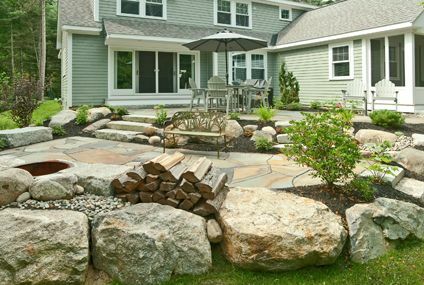 During construction, we unearthed several large boulders that were incorporated into the landscape design. Many of the plants in the design are native to the region, including blueberries bushes. This new-construction home with ocean views was a collaborative project with a local architect and builder. 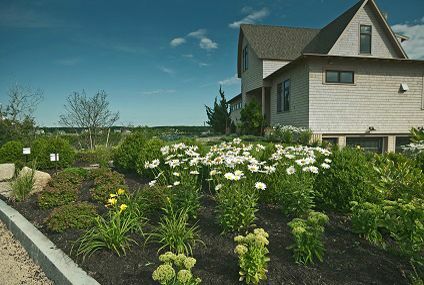 We provided the design and installation of plant material for the property’s compact lawn and garden. We designed the landscape over the winter, so it could be installed as soon as the snow melted in the spring. For this new landscape construction, the homeowner wanted a private patio that flowed from both the kitchen and the master bedroom. We took advantage of the grade creating two patio areas, one for dining, and a lower patio with a fire pit.